After the first week of August we'll be doing new sealed pools so be on the lookout for that. Before we get into the videos today I'd like to talk about some cards I personally underrated in my set review. This isn't to say that everybody underrated these cards, but that I myself did so. Set reviews aren't exact science and everybody is capable of making mistakes. This is an attempt to get better and to see why I was wrong about how I felt about the cards. What cards did you underrate? Let me know in the comments section below! I thought (Frontline Devastator) was going to be good, and instead it turns out to be great. Afflict makes it so there's a negative connotation to making even blocks and questions where or not you should make a favorable block. A card like (Frontline Devastator) means that you have an incentive to block otherwise you take extra damage, but if you do block you can't make a profitable trade due to the ability. Compounding that is the feel bad of blocking, losing life, and getting blown out by a combat trick. It's hard to play around everything that could happen, especially when you're on the back foot. While my experiences have dictated otherwise, I do think I give (Chaos Maw) the short end of the stick. In the right deck this can kill all your opponents creatures and leave you with a huge advantage. 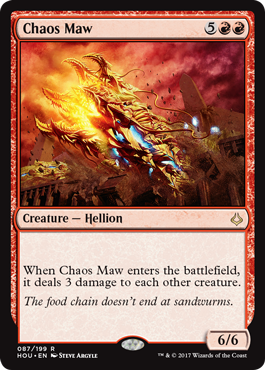 Chaos Maw does have downside and you do need to have a deck that has creatures that survive the trigger, but if you're able to curve out into this then you should be just fine. It hasn't done good work for me, but I've certainly seen it wreck me, so I'll give it that. 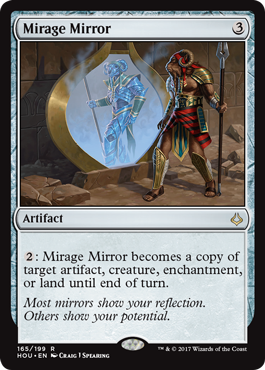 I think I was just okay on (Mirage Mirror), but after seeing people play with it and playing with it myself I can tell you that it's quite good. You can turn this into a creature with Exert and use the exert ability and have it still untap the next turn. You can copy their best creature at instant speed and use it as an attacker or blocker. It gives you a lot of options in combat and I have won games where it copied a flier that was enchanted by (Desert's Hold) and I could attack unimpeded. When I saw this card I wasn't impressed because if you don't have a Desert then you have just a 0/4 for two and not many decks want that. 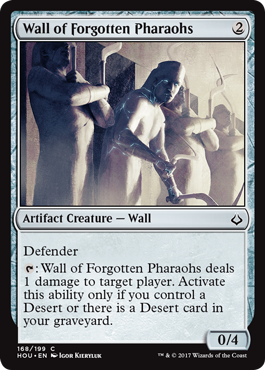 What I didn't understand was how easy it is to find Desert cards in your pool, turning this card into a colorless Lobber Crew of sorts. I've seen people much better than me play with the card, and having played with it I understand why they did so immediately. It holds back a lot more creatures than you would think and gives you reach whenever there's a board stall. It's a good blocker in this format and helps you with your goal of winning the game. With a first pick (Torment of Hailfire) over an (Hour of Revelation), I thought I had a great start to the draft. 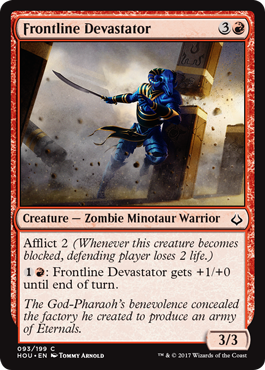 Black didn't seem open, but picking up (Manticore Eternal) and (Vizier of the True) while wheeling a (Resolute Survivors) told me that red and white were definitely open and I cemented myself in those colors early. Looking back at pack 1 I don't see a logical argument for anything other than heading into RW and not trying to force a black/x deck with only Torment of Hailfire as a good card. So RW it was and the next two packs didn't show me anything that would lead me down a different path, so why did this deck that seemed good end up 0-2 drop? It didn't match up well against what my opponents were doing and the longer the game went while I had only one card in hand, the worse it got for me since now my "topdecks" are just 2/2s for 2. That's fine when I'm trying to press an advantage, but if I'm trying to come back from behind I need something of substance. With a 1-2 and a 0-2 next to my name in Hour of Devastation draft, the beginning of this format does not look good for me. Perhaps I need to change tactics and draft something else. If the format is similar to sealed, then a slower deck should be able to win. We end up splitting this section of the league 1-1 and given how it went I think that's how it ends up being most of the time. I was absolutely destroyed in two of the three games I played in my second match while with some luck and aggression I was able to take the first match with the deck. Splashing for (The Locust God) didn't actually affect how I played the games, in fact when I did cast it I immediately died the next turn. It's unclear if the splash if worth it or not but given that I don't think it's hurt me, I'll still play it until I have a reason to do so otherwise. I feel like I could have won the second match if I had listened to myself and played around the (Hour of Devastation) that my opponent seemed to be telegraphing. I thought that I could still beat it with the cards in my hand, but I didn't realize that my opponent was holding onto cards to lure me into a trap. I would have been better off not casting anything and making my opponent make the first move. In sealed its very rare that your opponent keeps their seven cards and has nothing to do, so in those cases you need to ask why they're not playing anything. More likely than not it's because they have a sweeper in hand. If they do actually have nothing, then it doesn't matter if you add another creature or not, you're going to win. Going into the first three matches I've been watching Michael Jacob (Darkest_Mage on Twitch) stream a lot of Hour of Devastation Sealed and given his 60%+ win rate, I thought it'd be best to take some things that I learned watching him into this pool. I've noticed that he's had ease playing 3+ color decks when the mana fixing is plentiful, so while I wanted to try straight GB for the first round, I made a 4 color list that splashed blue for a few creatures and white for the other side of (Grind/Dust). It seemed to be that it could be more powerful than my GB deck but a little slower which could hurt it against a fast start. Nonetheless I opted to start the GB deck and it became very clear that it was not good at all. Even with poor draws in the first match I knew it wasn't up to snuff. I didn't know how good the other deck would be, but it'd be better than trying the first deck again. To my surprise it worked well enough to win the next two matches and end the stage at 2-1. I had more removal and card draw and a trump card in (Torment of Hailfire) that seemed to be more potent here than in the first deck. For the moment I'll make changes to the four color deck and keep playing that one. Draft aside I think my sealed are going better than I thought they would, so I have that to fall back on. I would like to try and draft something slower next time to see if I need to be slower to have a chance to win in this format. I don't like being 1-4 right now and I would really like that to change. What do you think is going on? Did I get unlucky in my first two drafts? Or am I just drafting the wrong strategy? Let me know in the comments section below what you think. Next week I'll be back with more draft and sealed action featuring Hour of Devastation. If you have any comments, questions, or concerns leave them in the comments section below. You can subscribe to my YouTube channel here where you'll find all the videos seen here much earlier than normal along with content exclusive to the channel. 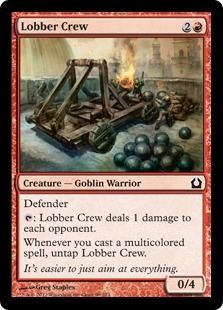 Right now I'm trying to make Grixis Control work in Standard, so let's make it work together.